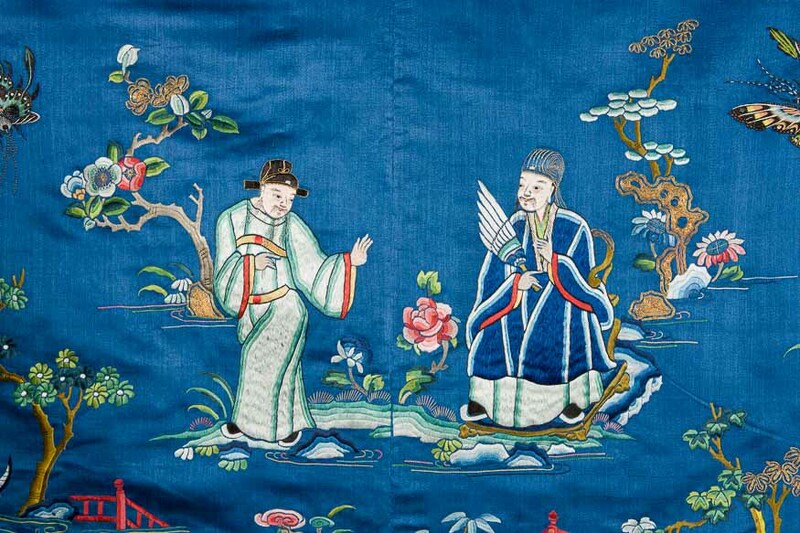 The Qing Dynasty(1644-1911) was characterised by an astounding wealth and variety of robe types. The presented garments, including clothing both for men and women as well as accessories of children's clothing, perfectly reflect this diversity. 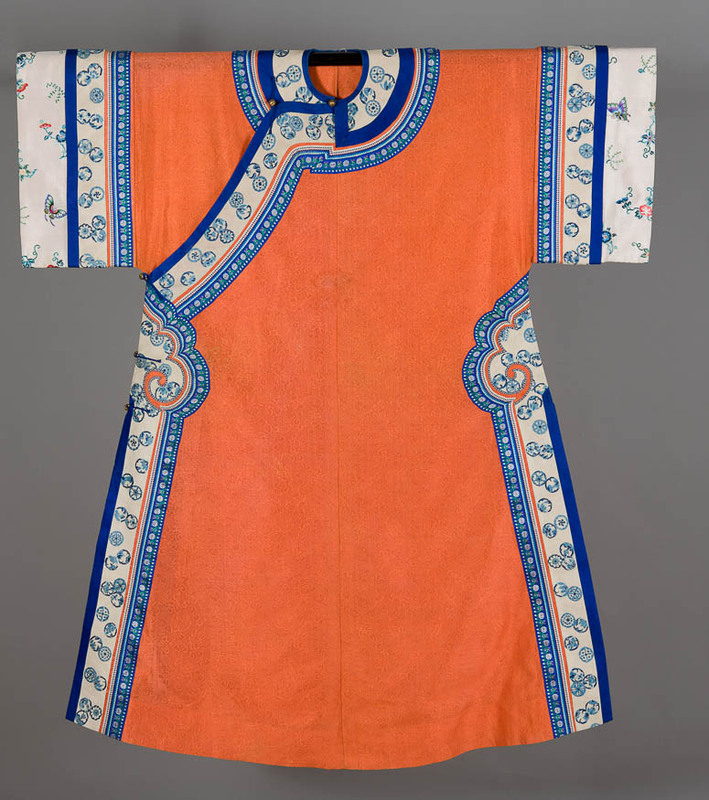 When the Manchu Dynasty seized the power in China in 1644, a new type of clothing appeared. First of all, there was a change in the cut of formal and semi-formal robes worn by both the Manchu and the native Han Chinese. 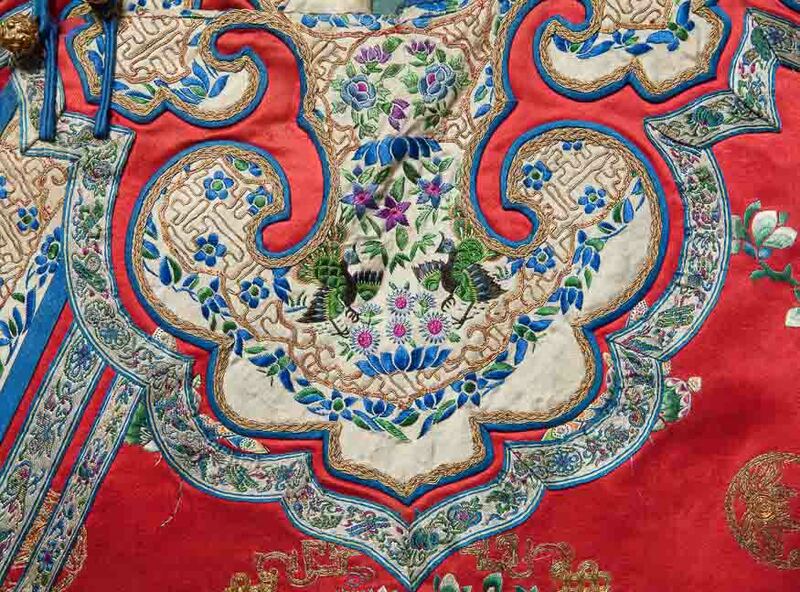 A new type of garments was introduced, the elements of which referred to the Manchu tradition. The robes were fastened along the right side of the body. Additionally, they were equipped with slits at the bottom – the Manchu were entitled to four, while the Hans had the right to two slits at the bottom of the dragon robe. The shape of the sleeves underwent a substantial change - long and wide sleeves were replaced by narrow ones. They also gained a very distinctive division into three parts. The upper part of a sleeve became integrated into the body of the garment. The central dark blue part covered the forearm, while the bottom part consisted of a matixiu cuff in the shape of a horse hoof, which shielded the hand. The Manchu, as an itinerant, nomadic people, wore robes of a cut suitable for horse riding. A matixiu cuff was meant to protect the hand, while the slits at the bottom of the robe, located in the front, at the back and at the sides, facilitated mounting a horse. A complete outfit also consisted of a bufu coat with a buzi badge, a piling collar, a ji guan bejewelled headgear, a chao zhu necklace, a jiao dai belt and shoes with high uppers. The robes of Manchu women differed from the clothing of Han women. What is worth emphasising is the fact that the ladies' wardrobes of the two nations borrowed certain elements from each other. A good example is the wide robe sleeves, typical of Han women's clothing, adopted by Manchu ladies for their informal everyday outfits. The main difference lay, however, in the length of the dress and the width of the sleeve. The Manchurians wore long robes with narrow sleeves, while the Han women wore short kaftans with wide sleeves and skirts. It should be noted here that the tradition of foot binding applied only to women of the Han nationality, which resulted in the need for sewing special shoes for them. Text by Beata Pacana – adjunct, Head of Department of Far Eastern Art, National Museum in Krakow. 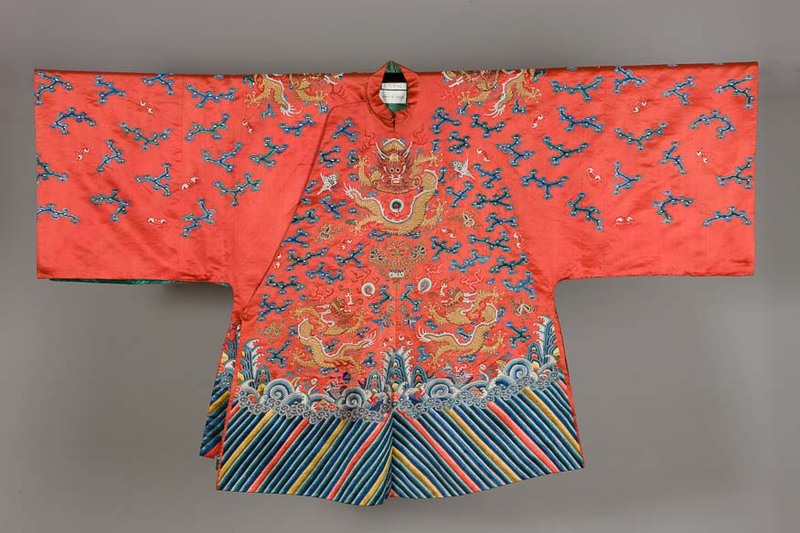 This men's garment, called a dragon robe, constitutes part of a traditional semi-formal ji fu outfit in the Manchu style. Wearing such clothing befitted the Emperor, his immediate family and the representatives of the clerical class. The members of the imperial administration, called mandarins by the Europeans, wore robes in dark blue colour. 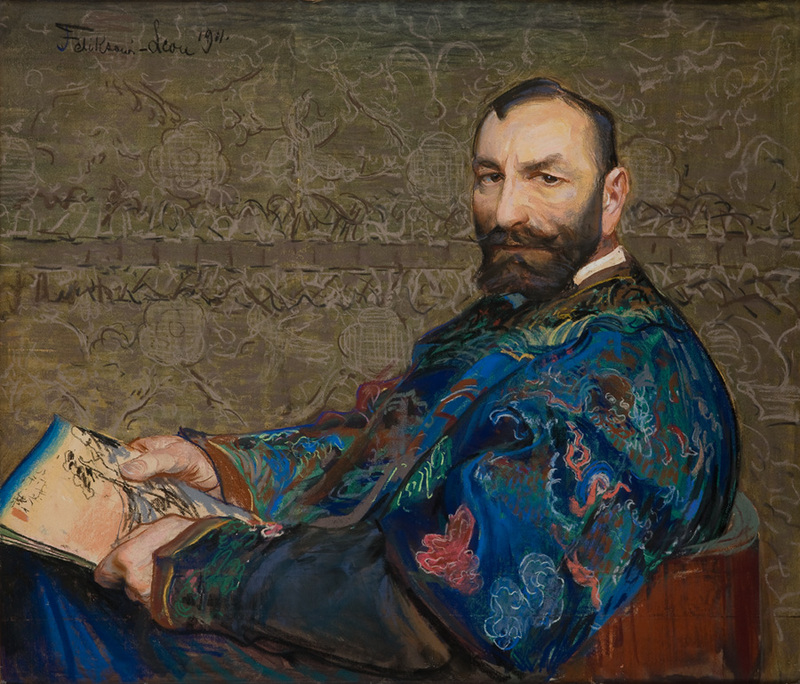 Leon Wyczółkowski, Portrait of Feliks Jasieński in a Blue Robe, property of the National Museum in Krakow The longpao from the collection of the National Museum in Krakow belonged to a prominent collector - Feliks „Manggha” Jasieński, who was portrayed in this particular garment by Leon Wyczółkowski. More information on this work can be found in the new collection catalogue of the National Museum in Krakow. Men's robe longpao Qing Dynasty, 19th-20th century. 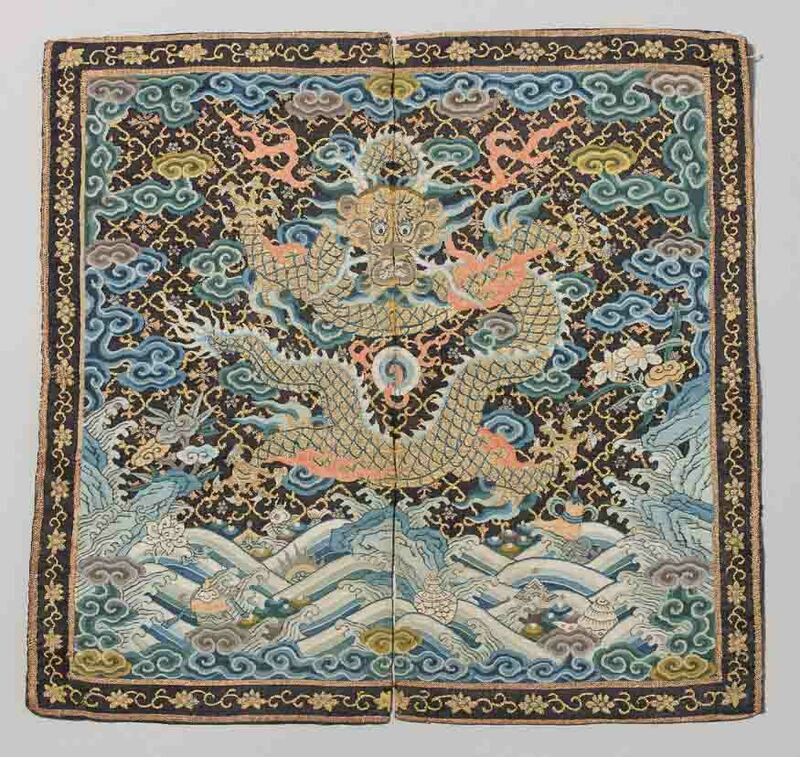 An imperial dignitary's buzi badge with an image of a long dragon Qing Dynasty, second half of the 19th century. An official's Mandarin buzi badge with an image of a crane Qing Dynasty, second half of the 19th century. Badges with an image of a crane were attributed to the officials who, having passed multi-stage exams, achieved the highest rank. The extremely valuable background of the badge deserves a particular attention. Its green surface, with a metallic shine, was woven using peacock feathers. 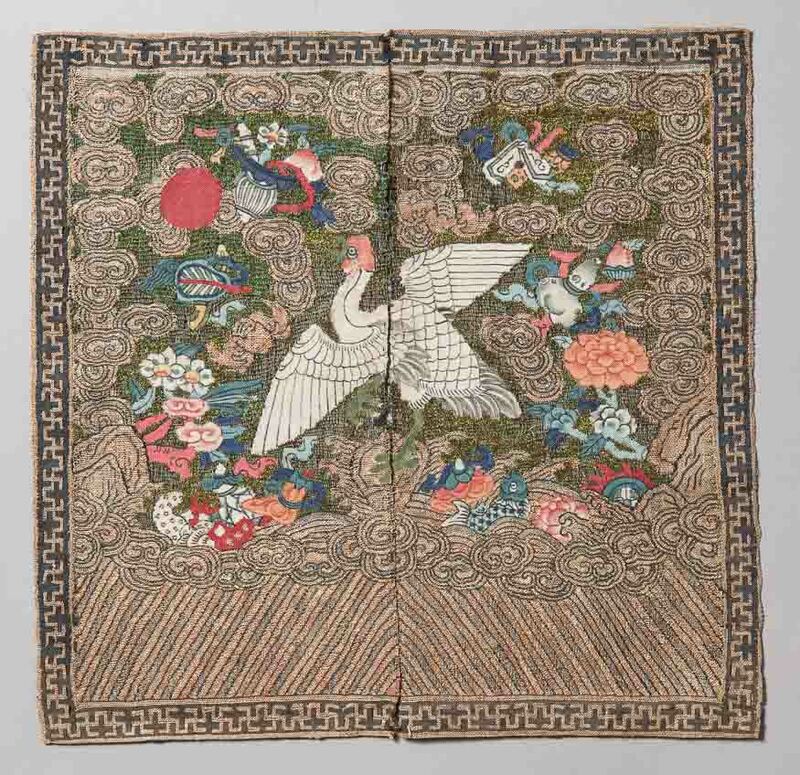 An official's Mandarin buzi badge with an image of a wild goose Qing Dynasty, first half of the 19th century, silk, golden thread, embroidery. This valuable badge, belonging to a fourth-ranking official and dating back to the late Manchu Dynasty, was decorated with numerous symbols of luck and longevity. It was made applying a couching stitch technique using a metal thread with a silk core. This technique, dating back to ancient times, involved forming a pattern of connected gold cords, fastened to the fabric with a silk yarn. Theatre costume Qing Dynasty, 19th-20th century. 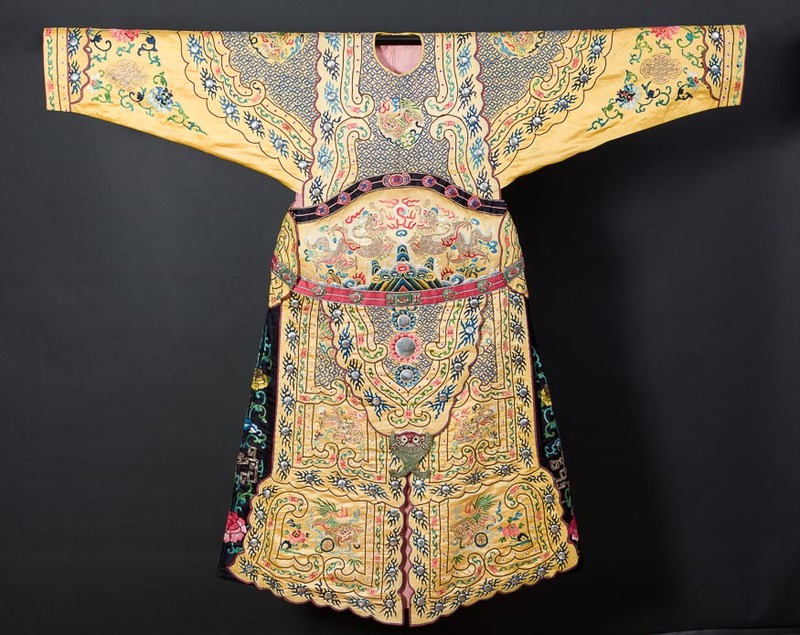 Woman's wedding robe mang ao Qing Dynasty, second half of the 19th century. 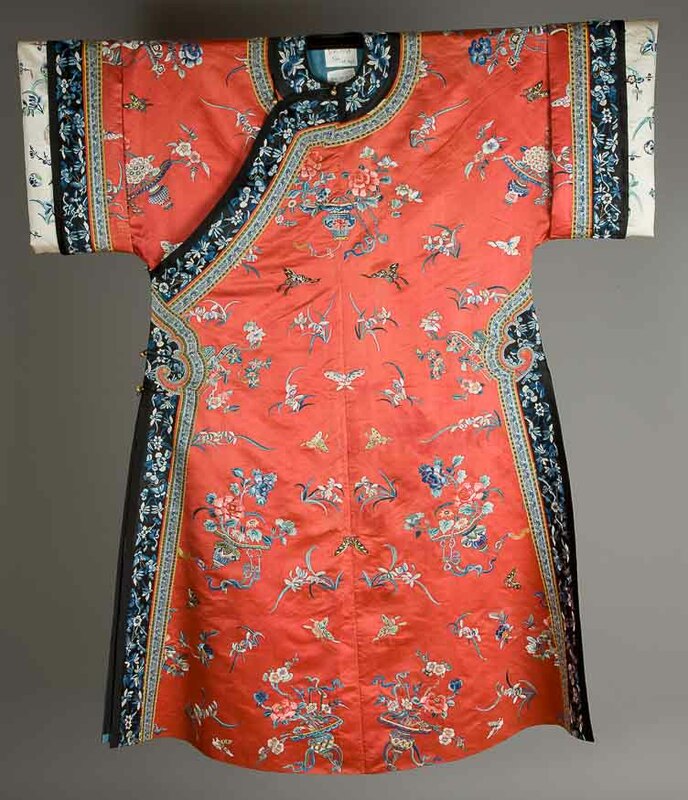 Worn on the occasion of weddings and official ceremonies, this particular type of outfit could only be worn by a wife of a Chinese official whose rank was appropriately high. Its red colour symbolizes prosperity, similarly to numerous bats and Taoist symbols. Woman's robe magua Qing Dynasty, 19th century. 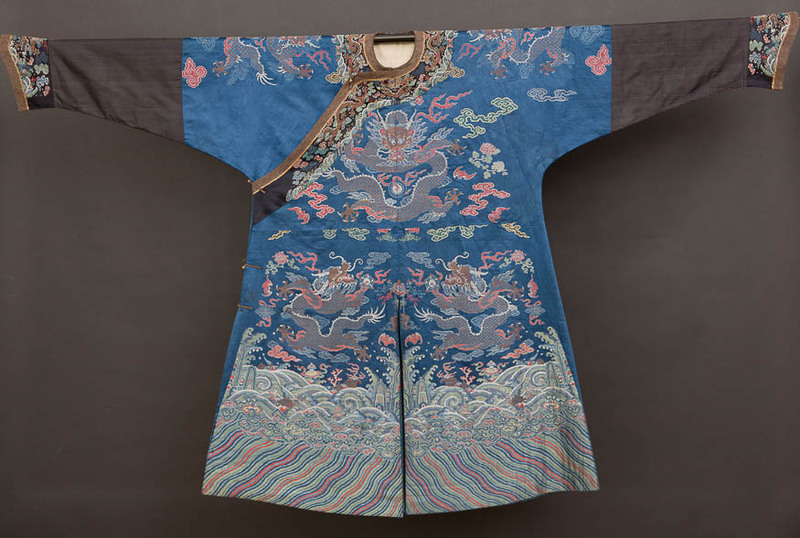 The main motif of the robe consists of eight medallions with court scenes embroidered in the landscape. Among the depictions, one can spot people playing the lute (sanxian), fishing, running with a kite, writing poems. 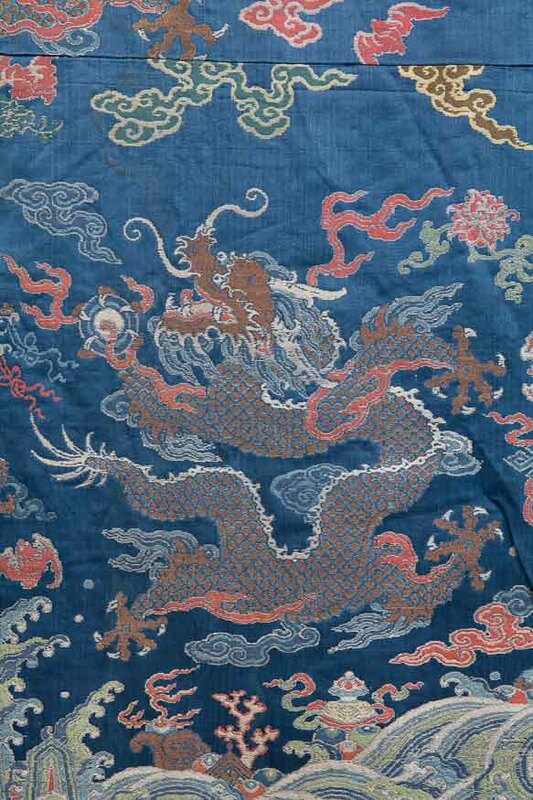 Note the decorative yun jian collar in the form of stylized clouds. 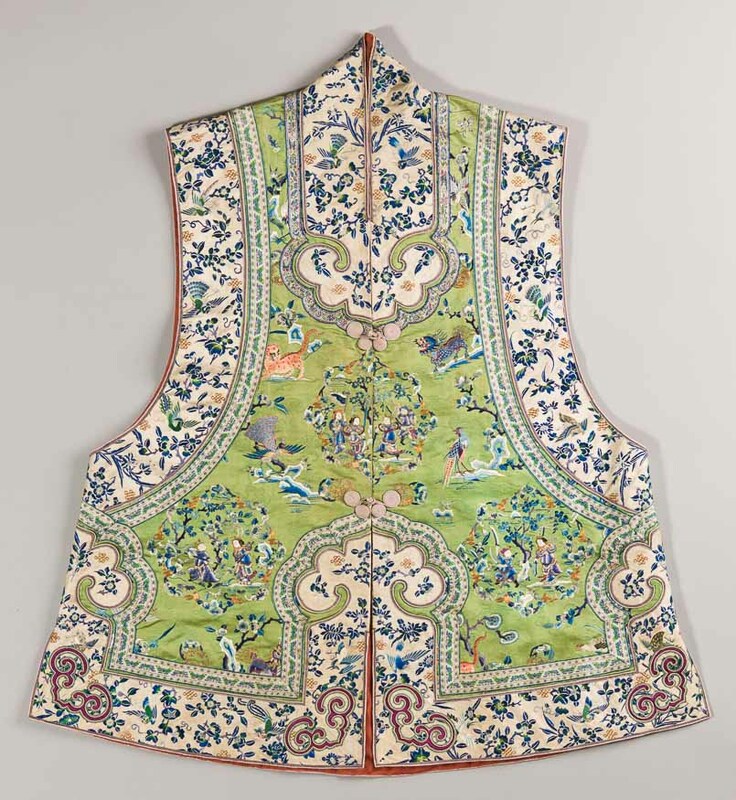 Woman's vest majia Qing Dynasty, 19th century. 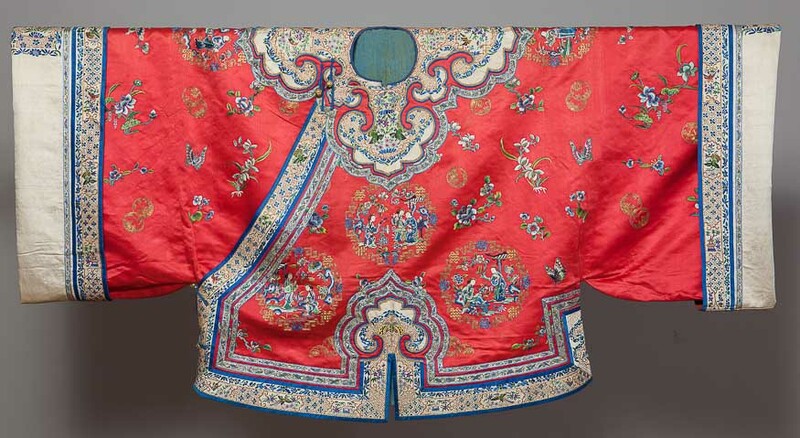 Woman's robe ao Qing Dynasty, second half of the 19th century. 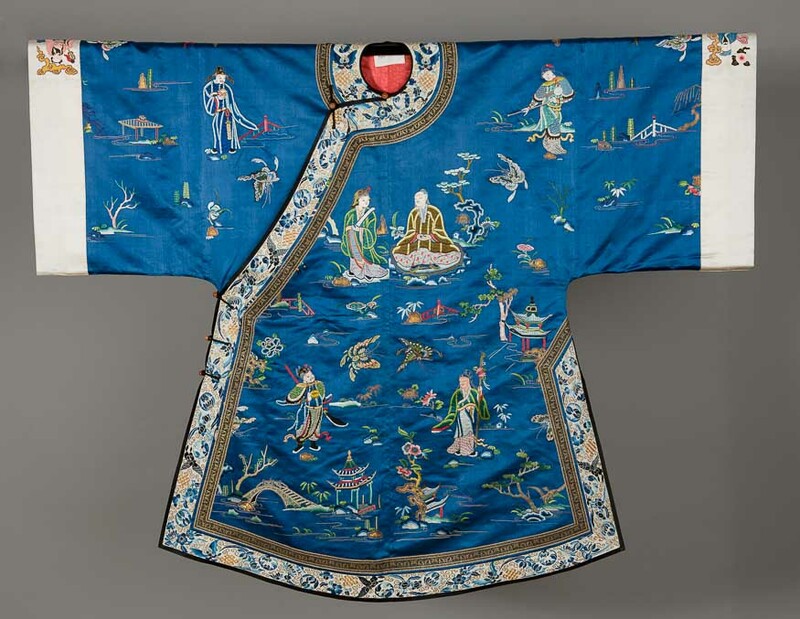 This casual woman's robe is adorned with the motif of the Four Nobles - plants symbolizing the four seasons. 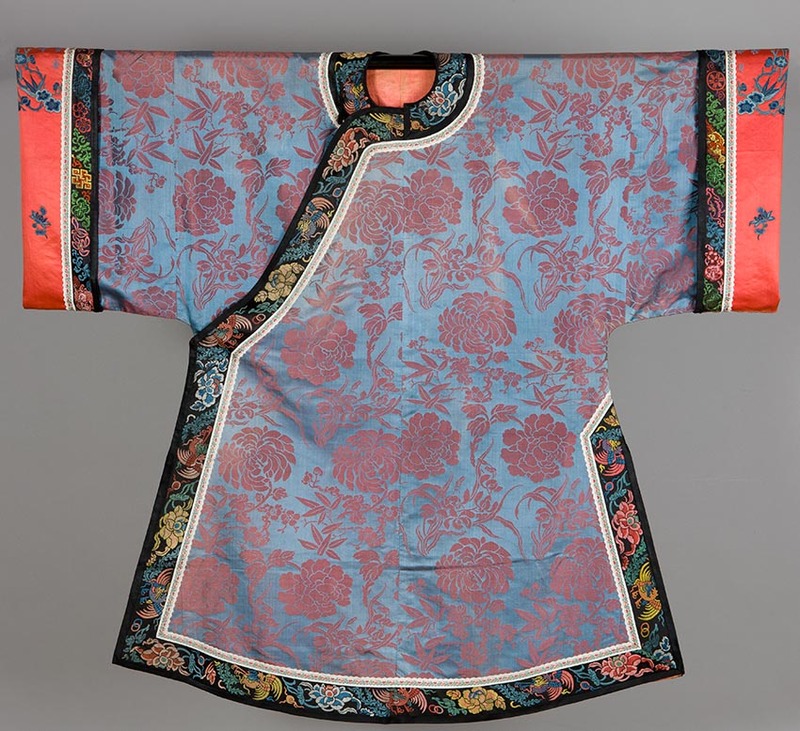 The two-coloured – blue and pink – damask contains depictions of plum blossom branches which refer to the spring, orchid flowers which symbolize the summer, chrysanthemum - the flower of the autumn and a bamboo representing winter. The peony, which appears in this composition, is regarded in China as the queen of flowers and refers to feminine beauty. Woman's robe changyi Qing Dynasty, first half of the 19th century, silk, gilded copper button knots, embroidery, applique. 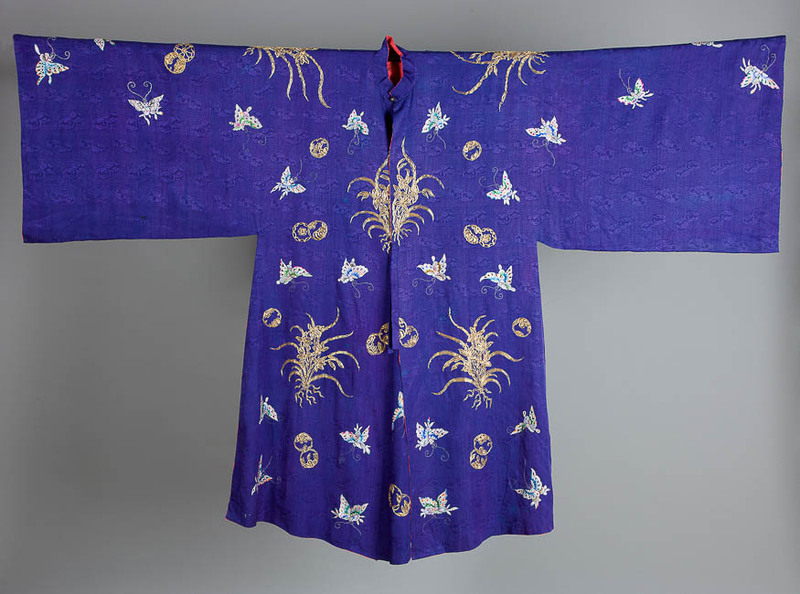 The main decorative motifs of this robe are orchid flowers and butterflies. The Chinese valued the orchid flowers for their subtle fragrance and elegance. They associated them with concepts such as love, beauty and fertility as well as with qualities of virtue and moral excellence. 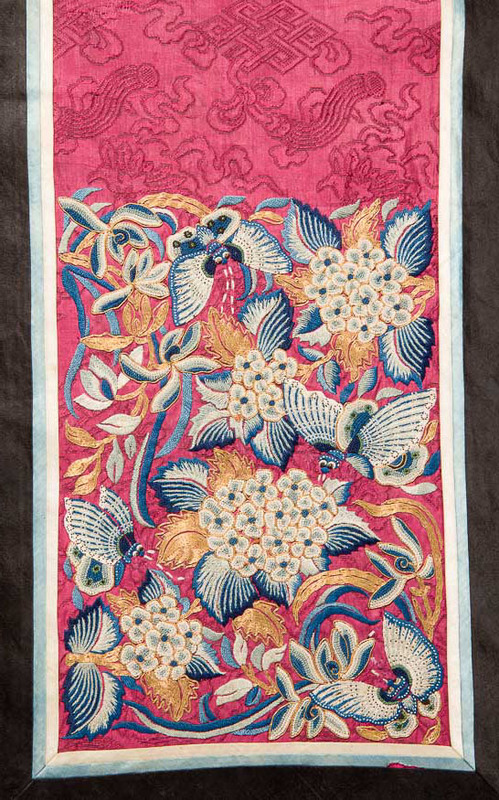 The motif of a hundred butterflies, symbolizing a Hundred Blessings, was a favourite robe pattern of the last Empress - Cixi (1834-1908). Woman's robe changyi Qing Dynasty, 19th-20th century. Woman's robe ao Qing Dynasty, early 20th century. 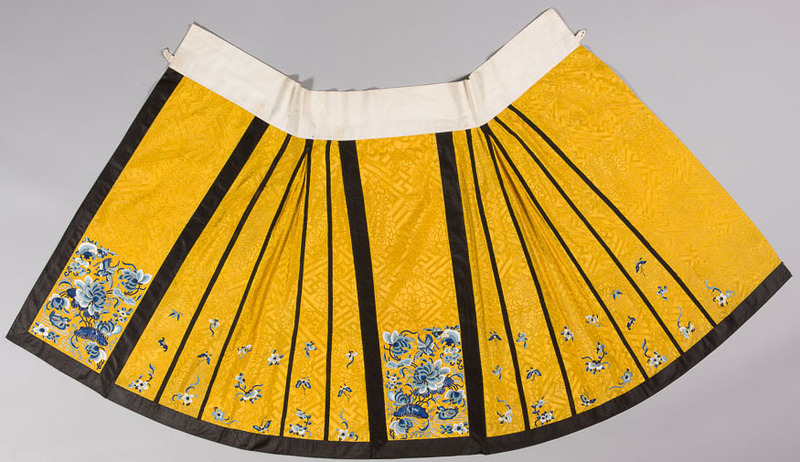 Qun skirt Qing Dynasty, 19th century. 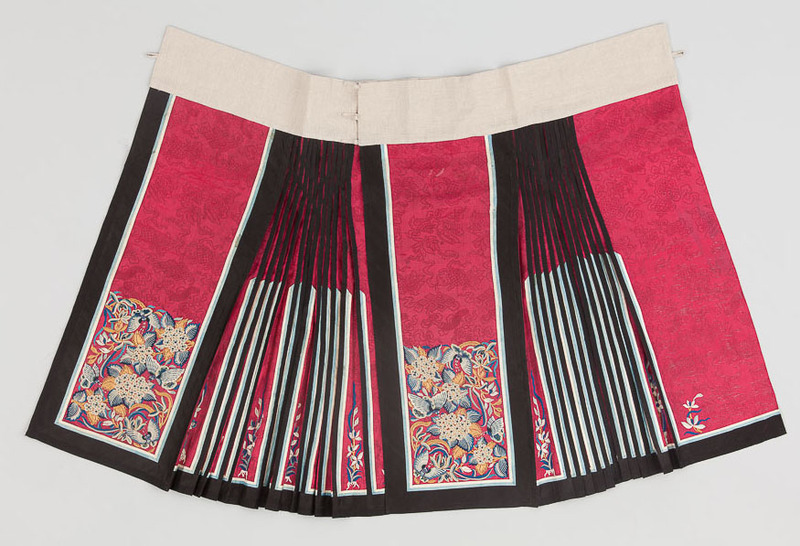 The collection of the National Museum in Krakow features a skirt made of silk gauze woven in a pattern depicting swastikas and peonies. 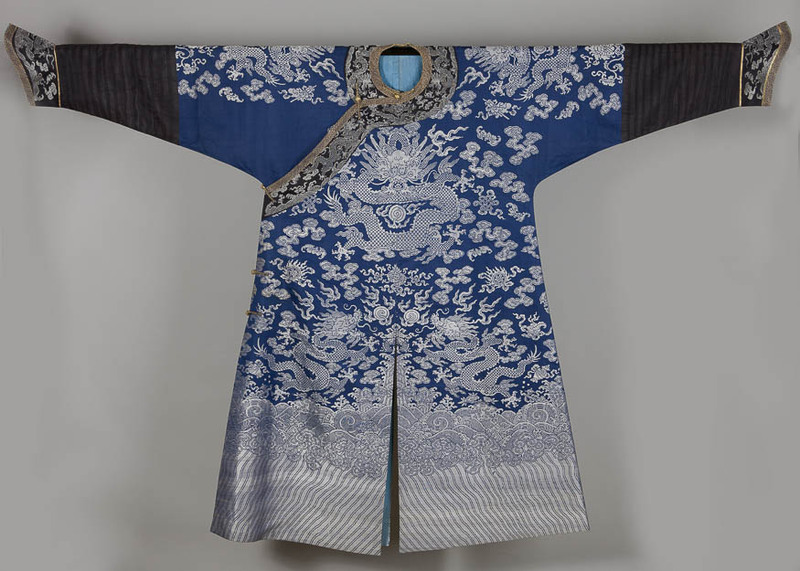 It is decorated with black trimmings and embroidery in the shades of blue (sanlan) with orchid, butterfly and bat motifs. 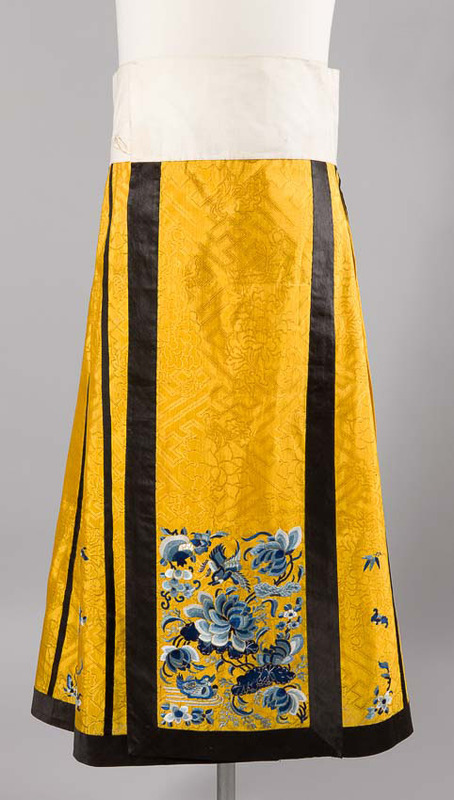 The front and rear parts of the skirt present an embroidered water landscape with a pair of Mandarin ducks among lotus flowers, peonies and pomegranates. Woman's robe waitao Qing Dynasty, 19th-20th century. 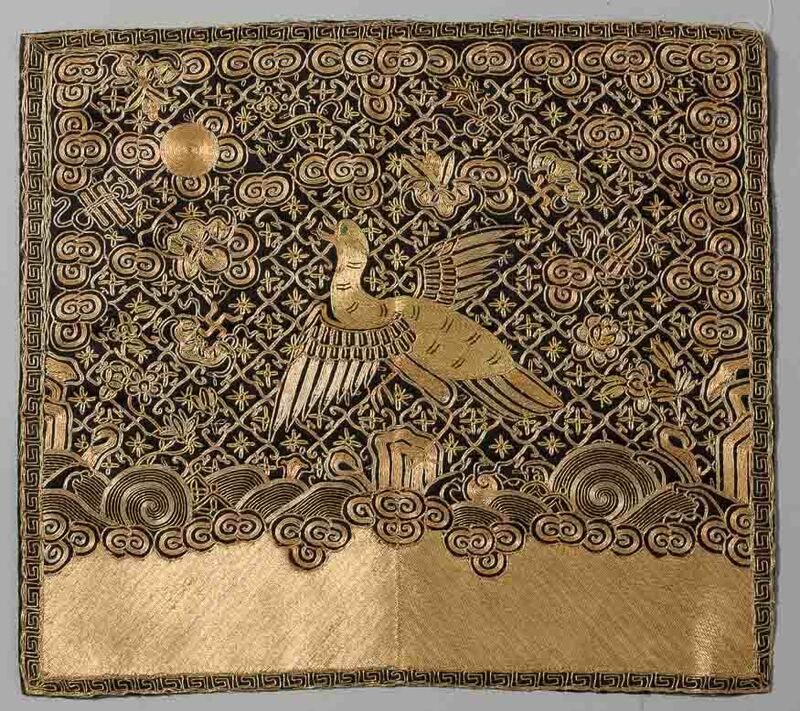 Qun skirt Qing Dynasty, 19th century, silk, golden thread, embroidery. 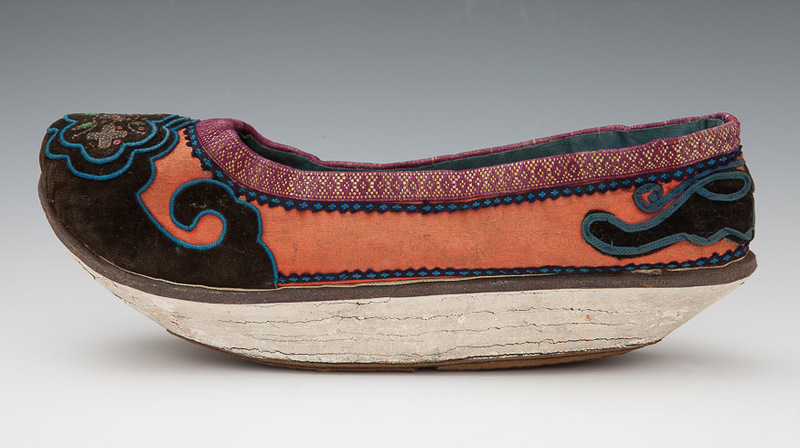 A pair of children's shoes Qing Dynasty, 19th century. Silk, cotton, golden thread, leather, glass, embroidery, applique. 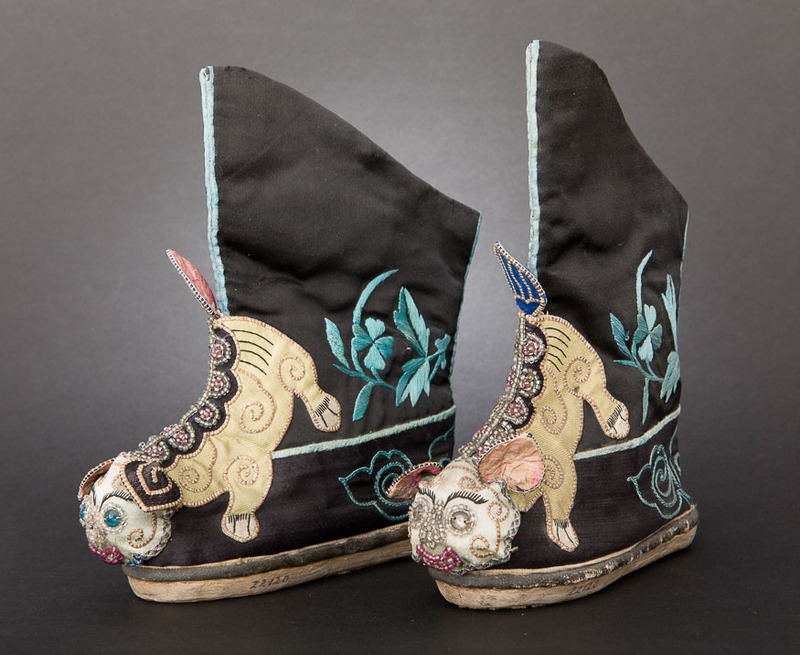 In China, children's shoes were decorated with auspicious images of tigers or lions (shizi), which were meant to protect them against evil demons. The eyes and ears were distinctly highlighted as those were the parts of the body through which the animals recognized dangerous powers. Similar motifs were also used to embellish headgear and entire outfits for children, particularly around the New Year or other major holidays. Shoe on a thick sole Qing Dynasty, 19th century. 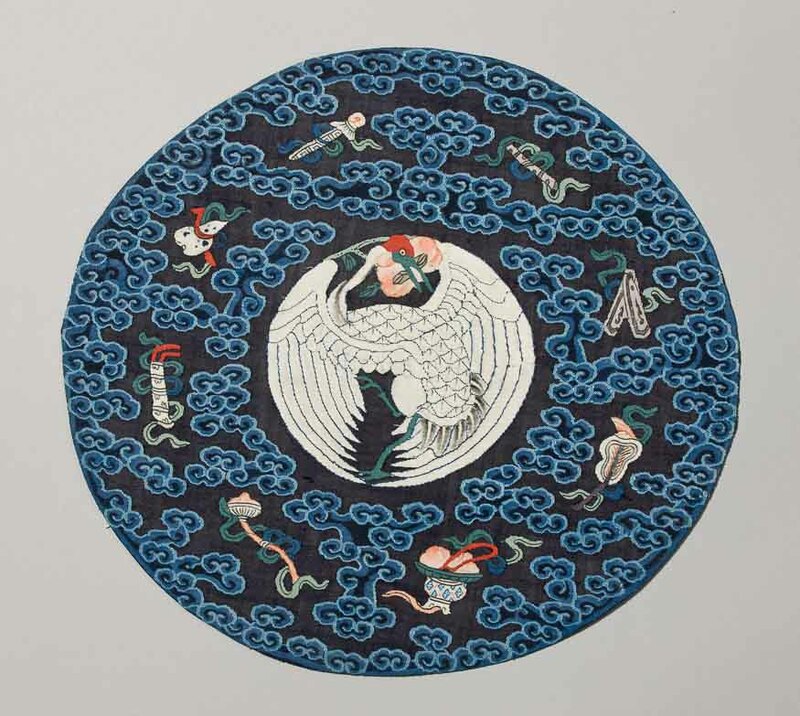 Medallion from a birthday robe Qing Dynasty, late 19th century. The image of a peacock with a peach branch and Taoist emblems are popular symbols of longevity and prosperity. Robes adorned with such motifs were worn on the occasion of birthdays.